Politics and Faith interprets the partnership of Reinhold Niebuhr and Paul Tillich by exploring their relationship and mutual influence. Ronald H. Stone draws upon a survey of their students, their published English and German work, their letters, their organizations, the Federal Bureau of Investigation’s files, and his relationship with them, their families, and colleagues to provide a fresh account of their work and life in New York City. They were shaped by their service in World War I, their development in revolutionary Germany, and in New Deal America as the two empires prepared for their second war. Allies in World War II against Hitler, immediately after the war they were thrown into interpreting the cold war world. Neither would live to see it climax in Tillich’s beloved Berlin. Stone’s unique perspective derives from his study with these two men and his service as Reinhold Niebuhr’s last teaching assistant. Knowing them from their preaching provided an intimate glimpse into their spiritual life. During his teaching career, Stone served as president of the North American Paul Tillich Society and was a founding board member of the Niebuhr Society. He previously edited or authored seven books on his mentors while teaching about them at Union and Pittsburgh Theological Seminaries, Vassar and Morningside Colleges, and Columbia, Duquesne, Pacific Lutheran, and Pittsburgh Universities. The differences between Niebuhr and Tillich in theology and philosophy produced an alliance in social thought and politics. Despite one third of the book considering the many criticism of their work, Stone finds the two producing the most adequate faith-based political philosophy for the guidance of the American Empire in the twenty-first century. 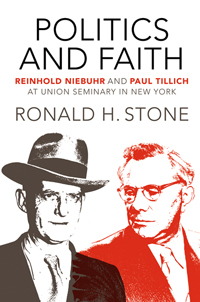 Everyone interested in the lives and careers of the two greatest American philosopher/theologians of the 20th century—Reinhold Niebuhr and Paul Tillich—will rejoice at the publication of Ronald Stone’s magnum opus, Politics and Faith: Reinhold Niebuhr and Paul Tillich at Union Seminary. Stone’s personal connections with the two great figures, and his previous publications dealing with their lives and thought, place him in an unrivaled position to review their activities and interactions in the crucial period of 1933 to 1955, when they were colleagues at Union Seminary. This work is a monumental effort that sheds new light on their perspectives, and indeed provides new insights into that whole period of American history... ...Stone’s Politics and Faith will stand alongside Richard Fox’s Reinhold Niebuhr: A Biography and Wilhelm and Marion Pauck’s Paul Tillich: His Life and Thought as an indispensable source for knowledge regarding the lives and thought of these two towering figures in 20th century philosophical theology.